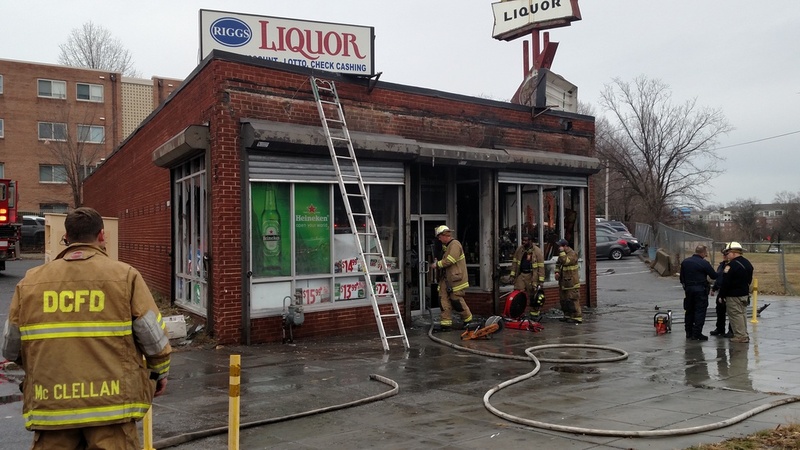 On December 18th FFA Sef Dispatched the Rehab Unit on this Working Fire Dispatch at 310 Riggs Rd NE upon hearing units arriving on the scene with heavy smoke showing front and rear of a 1 story liquor store. 1 injured Firefighter was transported to the Hospital. Rehab Unit operated for 2 1/2 hours. 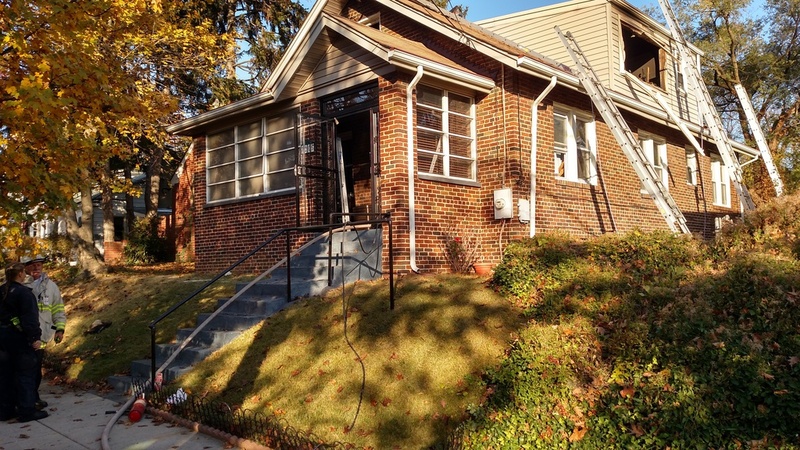 On November 17th, immediatly after clear the 2nd alarm at 215 Pennsylvania Ave SE the Rehab Unit was dispatched to respond on the Working Fire Dispatch at 7205 8th St NW. The Rehab Unit operated for 2 hours. 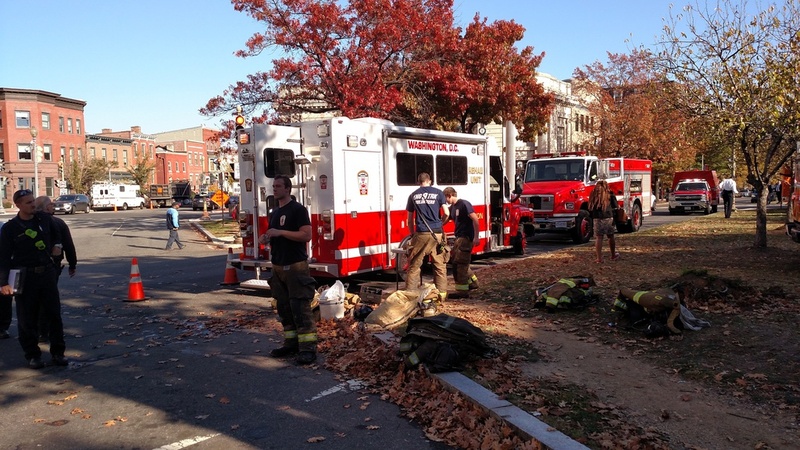 On November 17th, the Rehab Unit responded to 215 Pennsylvania Ave SE on the 2nd Alarm Fire. Units on scene reported fire in the ventalation ducts over a kitchen. This fire also brought in Mutual aid Units to the scene and for coverage. 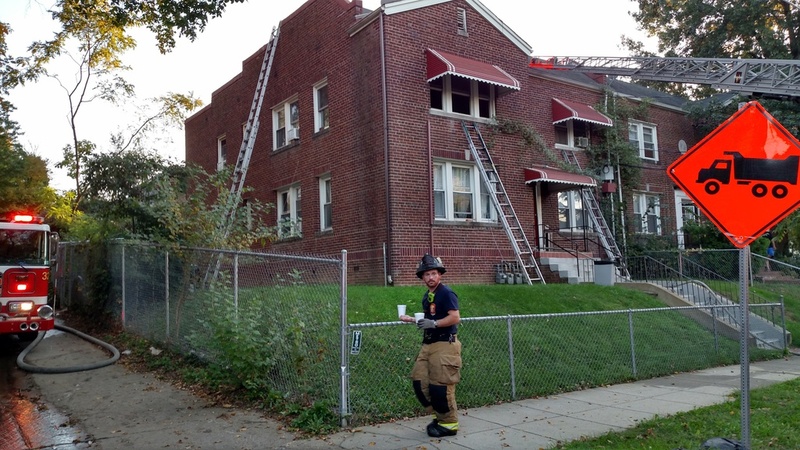 On October 18th just 2 hours prior to a FFA Membership meeting FFA was called to respond with the Rehab Unit to 2806 Q St SE for a Working Fire. This was a stubbern blaze which was in a upstairs apartment and the roof area. 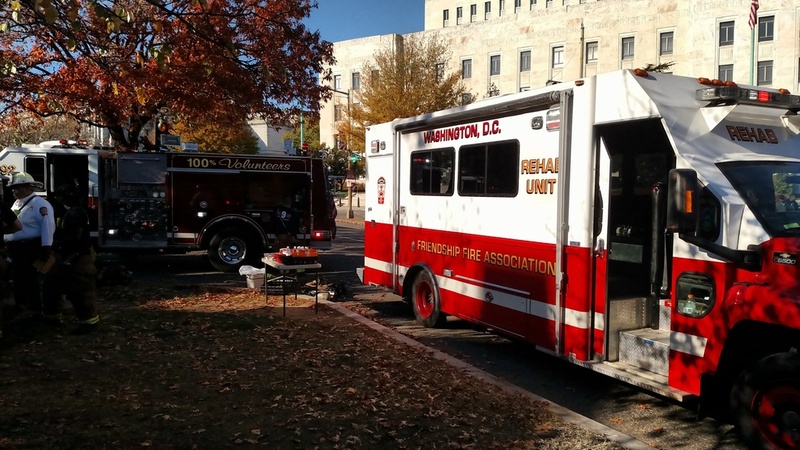 In the early morning hours of October 9th the Canteen Unit with a crew of 4 travelled to National Emergency Training Center (NETC) home of the National Fallen Firefighters Foundation Memorial. 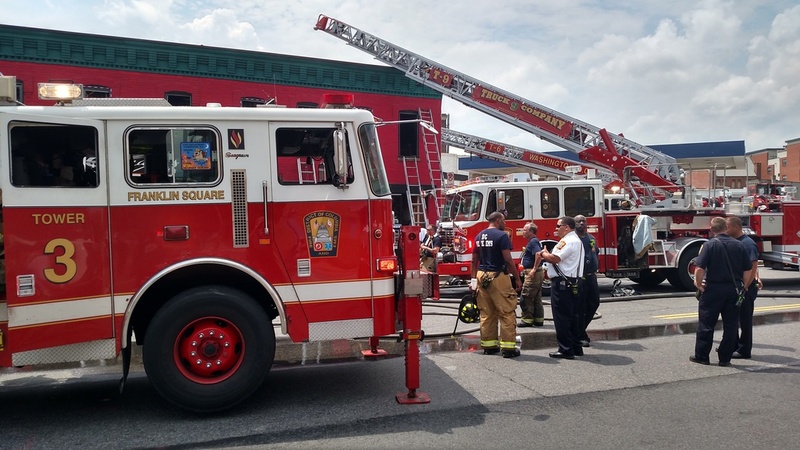 The DC Canteen Unit worked with Bell & Siren Club from Newark, NJ and Independent Hose Co. from Frederick, MD. All 3 Cantten Units operated under the direction of Chris Oliphant for approximatly 7 hours each. This year was especially hard for DC as Lt. Kevin McRae (E-6) was one of 112 Fallen Heroes during CY2015. 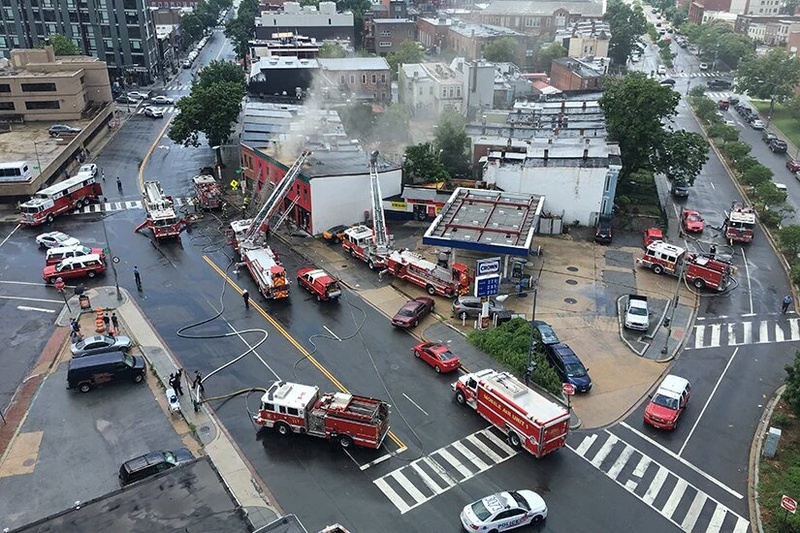 For the second time for the day on September 10th, 2016 about 2215 hours DC Fire and EMS was called for fire in the rear of a building but this fire had spread to much prior to arrival of the DC Fire & EMS Department. Units arrived and and knocked the fire down on the first floor but fire still persisted on the 3rd floor and cockloft. About 2245 hours a 2nd alarm was dispatched and all companies were eventually put to work. Both the Rehab and Canteen Units responded to the fire with a total crew of 8. 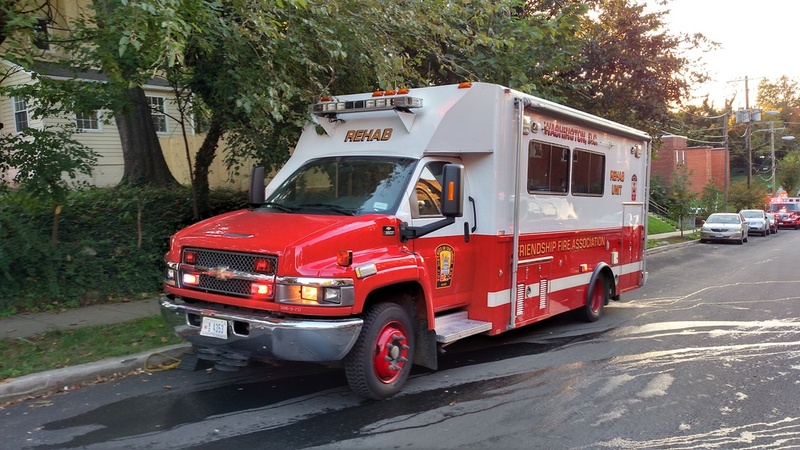 On September 10th, 2016 the Rehab Unit was alerted to respond with the Volunteers of the Friendship Fire Association on a Working Fire Dispatch. The association was requested to assist with the 3 R's (Rest, Rehydration & Rehab) due to todays intense heat & humidity. The fire started on the ground floor in the rear and vertically extended to the roof of a 3 story middle of row dwelling. 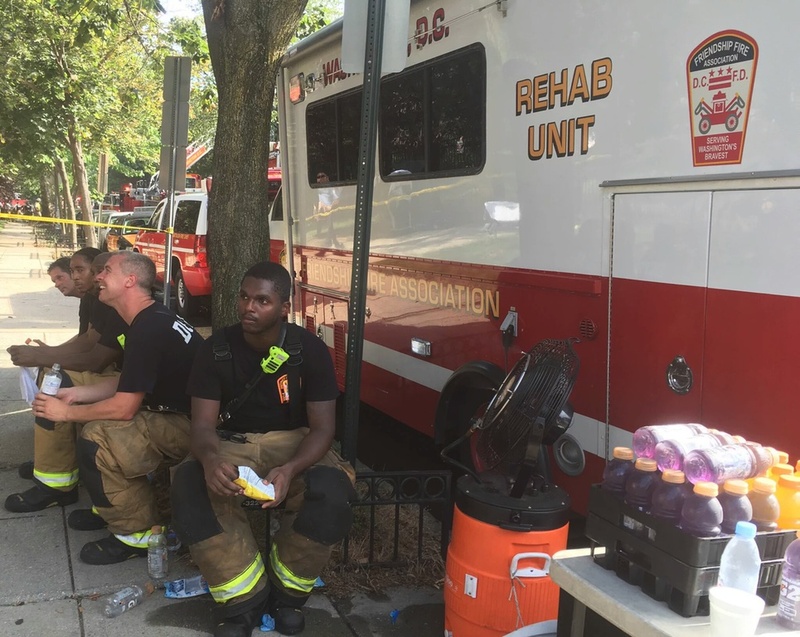 On August 14th, 2016 During the heat of the mid-afternoon the Rehab Unit was alerted to respond on a Technical Rescue for a person who had fallen from attic & in between brick walls. 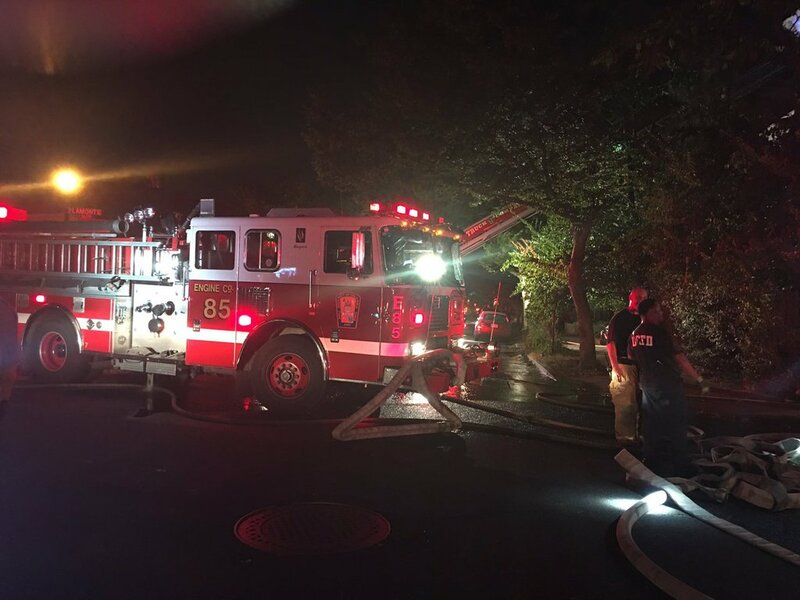 On August 4th, 2016 about 1545 hours the Rehab Unit was alerted with the Working Fire Dispatch to 2620 R St SE for heavy smoke showing from a 2 story middle of row dwelling. 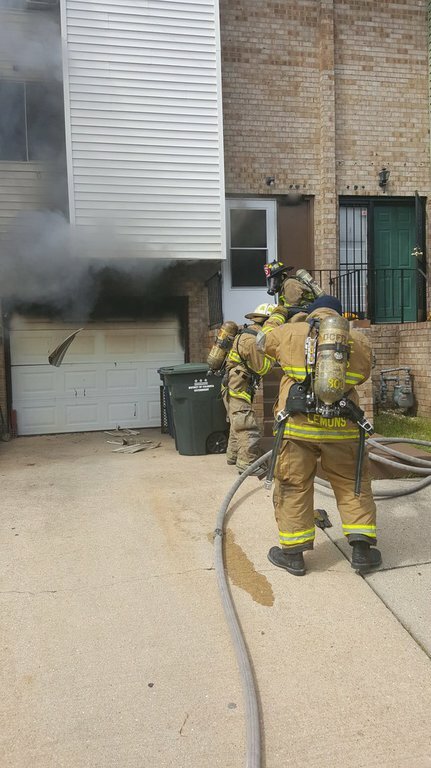 The first arriving companies found fire in the garage. The fire was brought under control in about 15 minutes. COFO/VP Chris Oliphant & Treasurer Walter Gold responded with the unit and meet on the scene by Pres Embrey which operated on the scene for approximately 1.5 hours. On July 30, 2016 at 1315 hours the Rehab Unit was alerted with the Working Fire Dispatch to 900 Flordia Ave NW. 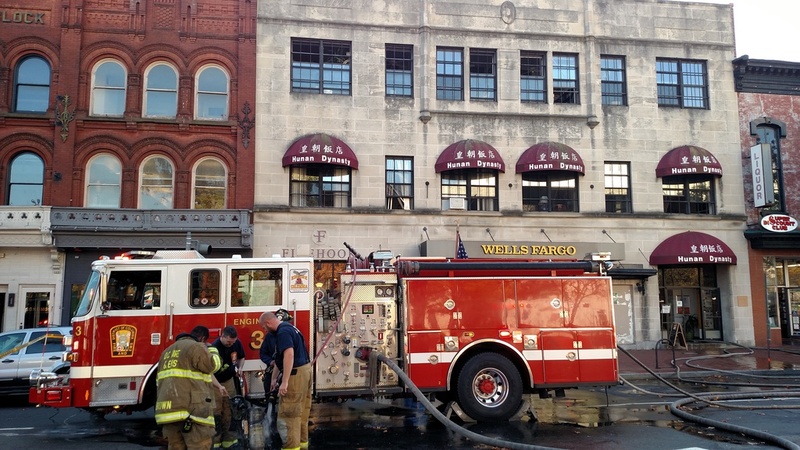 for an electrial fire in a 2 story commercial restaurant that produced heavy smoke conditions throughout the building. The fire was brought under control in about 15 minutes. COFO/VP Chris Oliphant responded with the unit which operated on the scene for approximately 2 hours and was assisted on scene by Treasurer Walter Gold and members Steve Bobys and Doug Kinney. 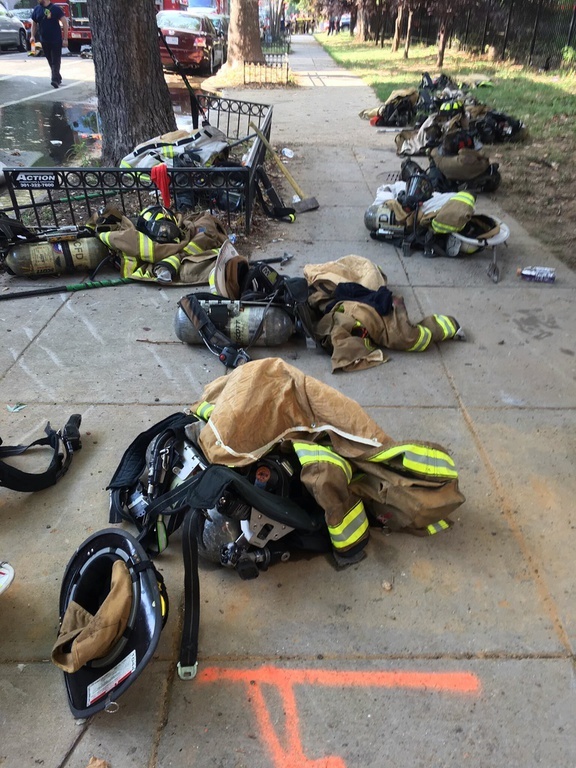 At 10:00 A.M. on July 23, 2016, DC Fire/EMS Units were sent to investigate a chlorine odor coming from the National Art Gallery located at 7th & Madison Sts., NW. Upon arriving, units discovered strong chemical readings throughout the building caused when a power failure shut off the ventilation systems for the sculpture gardens. 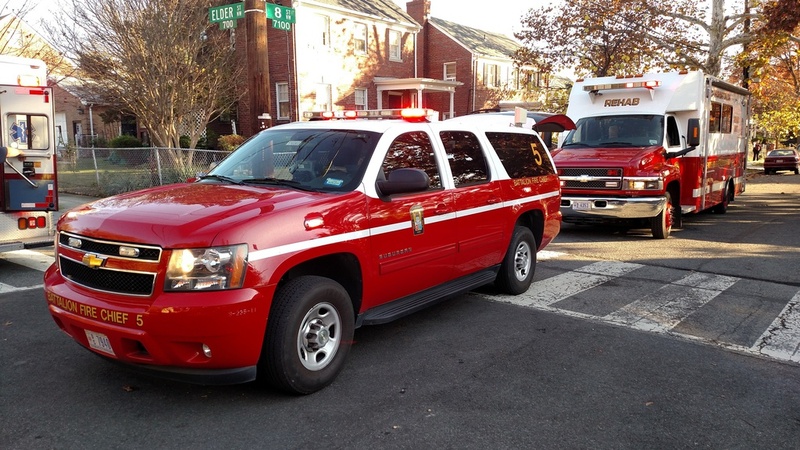 Battalion Fire Chief 6 then requested a Hazmat Local. The Rehab Unit, staffed for the day due to extreme heat conditions by COFO/VP Chris Oliphant and member Charlie Lewis, was also requested. 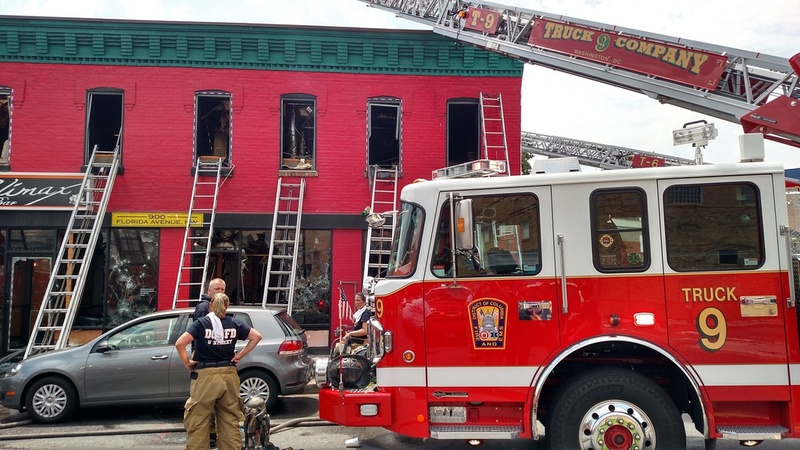 Units operated in 90+ degree heat for 4 hours to restore power and ventilate the building. 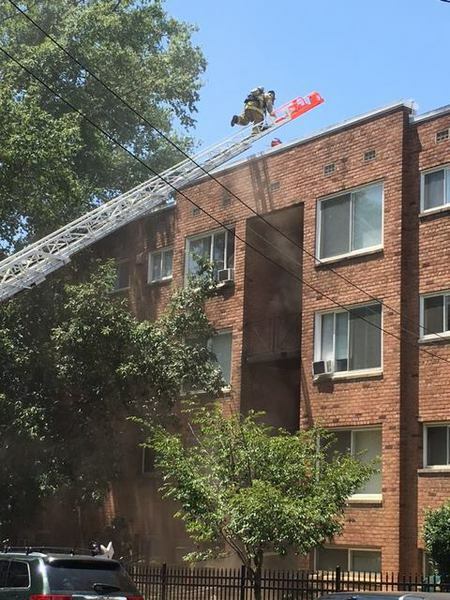 On July 26, 2016 at approximately 1600 hrs, Ambulance 16 radioed in a priority message to DC Fire and EMS Communications requesting a box alarm assignment to 1308 12th St. NW for heavy fire from a 3 story ordinary construction apartment building. BFC6 requested a second alarm shortly after arriving reporting fire from the 3rd floor through the roof of the building. 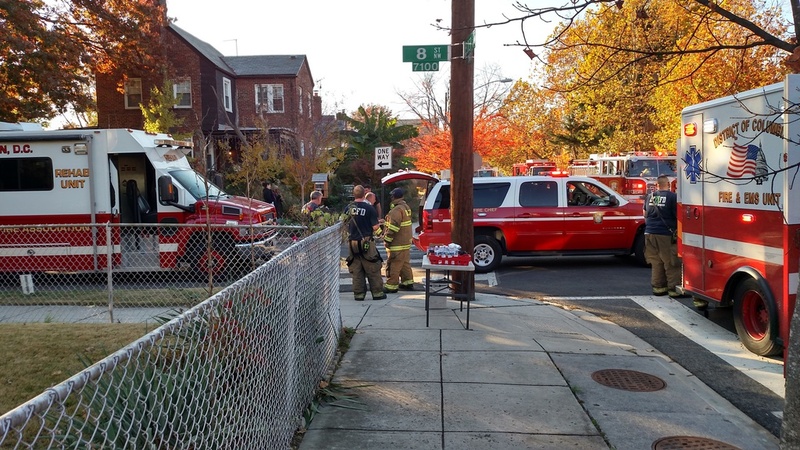 2 engines & 1 Truck were also requested above the second alarm assignment later in the incident. 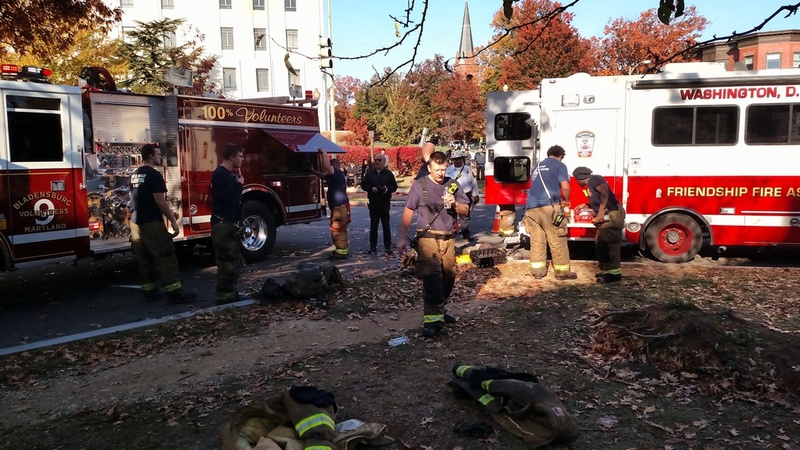 COFO/VP Chris Oliphant responded with the Rehab Unit and was assisted at the scene by member Elliot Goodman. 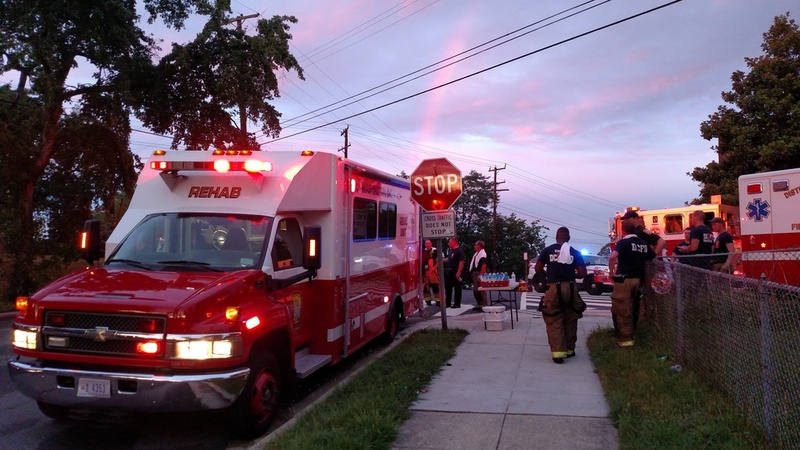 Rehab was setup on the fireground along with the Mass Casulty Bus to assist with cooling. 1 victim, Lucy, a rat terrier dog, was rescued by police and transported by Ambulance 3 to City Paws Vet Clinic with burns to the paws. She was released after a few days. The Rehab Unit operated for four hours. 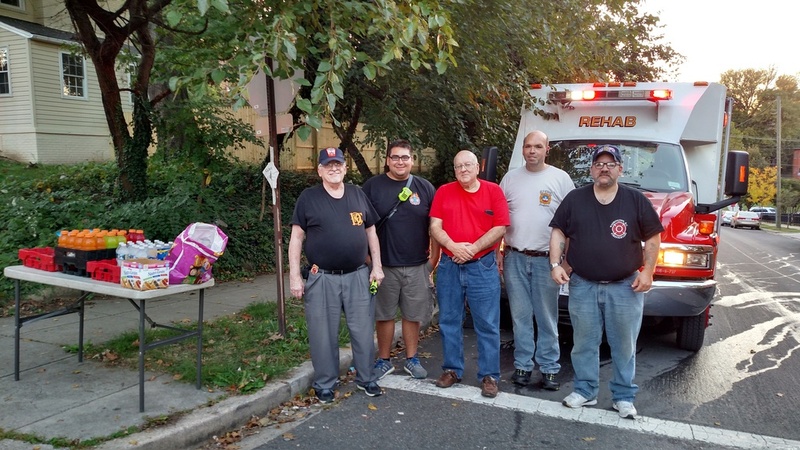 During that time, we received a visit from Paul Schaetzle, Treasurer of both the Jersey City, NJ Gong Club and the International Fire Buffs Associates. 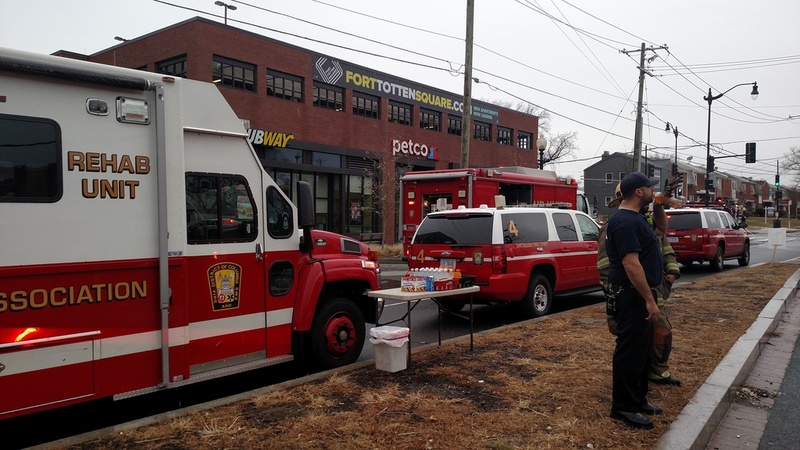 While companies operated at the fire, units from Prince George's Co, MD and Arlington Co, Va assisted with filling in stations. Three firefighters were transported to the hospital with injuries sustained while battling the blaze. The Friendship Fire Association would like to congratulate Fire Fighter Technician Kevin Adams E-5 Platoon #1 on his retirement. He served the Georgetown area of DC for 30 years. His support in the field operations(while in quarters) of our association was above.and beyond the call of duty. We would like to wish him a happy and healthy retirement. 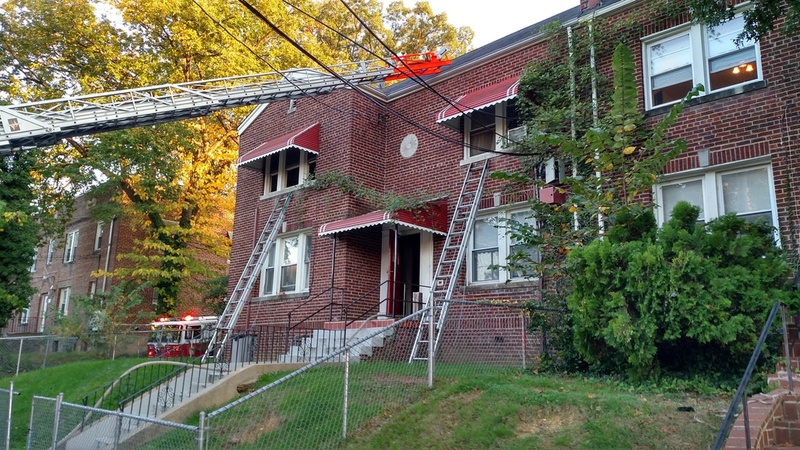 About 1930 hours just as the sun was starting to set DC Fire and EMS Engine Co. 14 was dispatched first due for the reportd house fire. On arrival they found fire showing from the basement and BFC #4 requested a Working Fire Dispatch. First arriving companies make a quick attack and knocked the fire down. In addition Animal Control was called for a deceased dog. 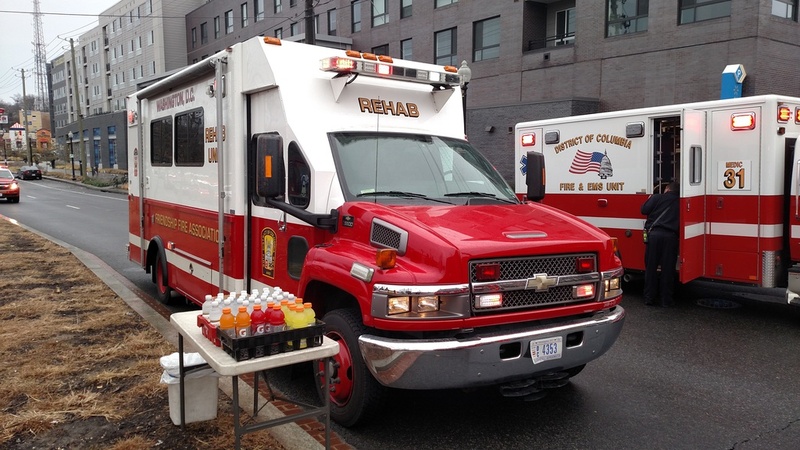 With it still hot outside the incident commander requested the services of the REHAB Unit manned by the members of the Friendship Fire Association to assist with rehydration and cooling. 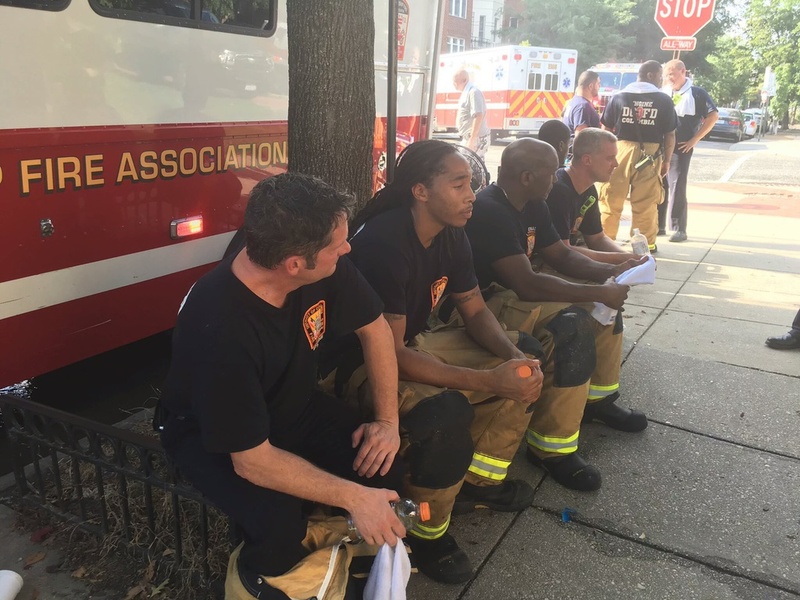 With the heat index raising over 100 degrees on Thursday, July 14th, it got even hotter after an apartment caught fire in Northeast DC. 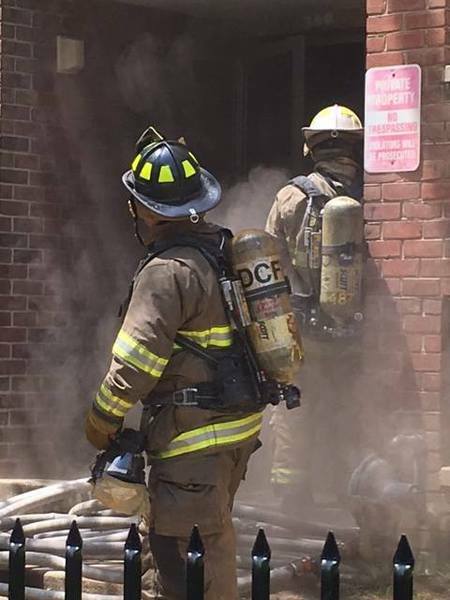 The flames erupted around 12:20 PM on the top floor of a three story occupied building in the 300 block of 62 Street Northeast. 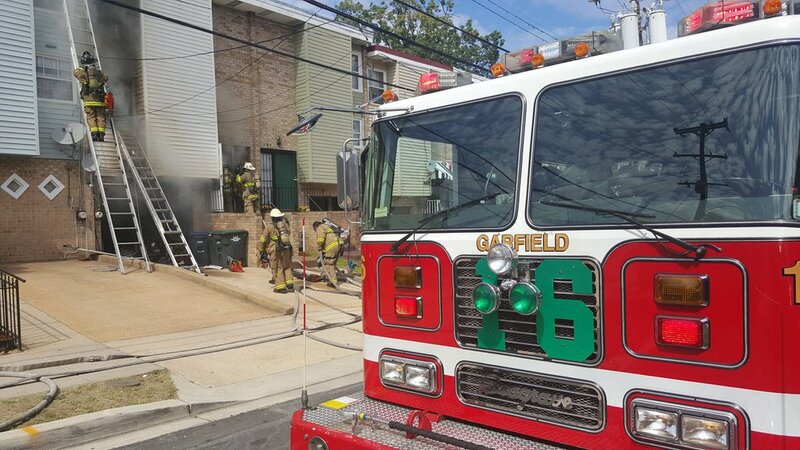 A box and working fire assignment was able to control the blaze in short order, with no injuries to firefighters or civilians. 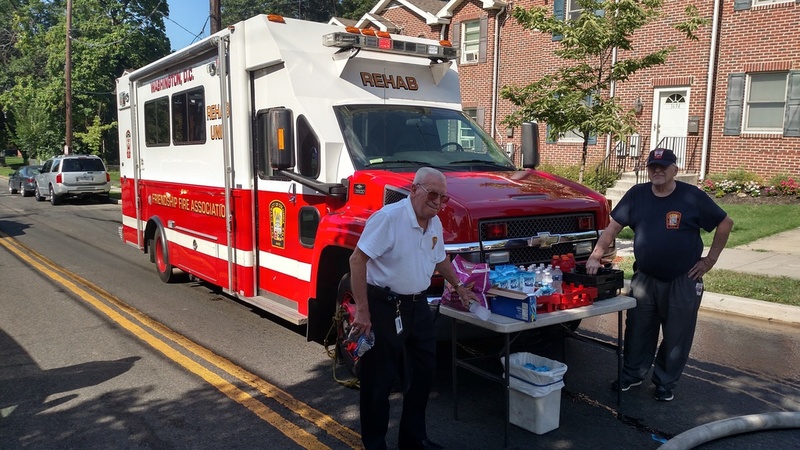 Our rehab unit, staffed by volunteers from the Friendship Fire Association, responded to the scene and provided cooling towels, gatorade, and water to firefighters as they went through their post fire medical assessment. The Retired Firefighter's Association Regrets To Notify Our Members Of The Death Of WILLIAM "REDS" W. HEFLIN On July 6, 2016. Brother Heflin Was Appointed 1-6-63 to E-31 & Retired 8-30-90 From T-9. Viewing; Tuesday July 12, 2016 10:00 To 11:00 Am With A Memorial Service To Follow At 11:00 Am. 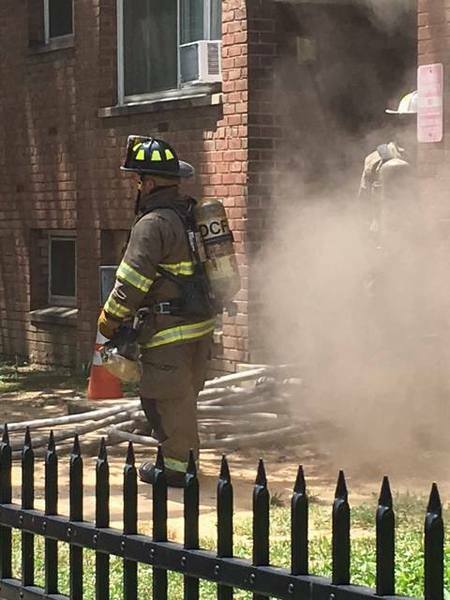 Location: Preddy Funeral Home, 59 Edgewood School Lane, Madison VA.
A family of three was displaced from their home after fire broke out in the 1500 block of Benning Road Northeast on Thursday afternoon, July 7th. 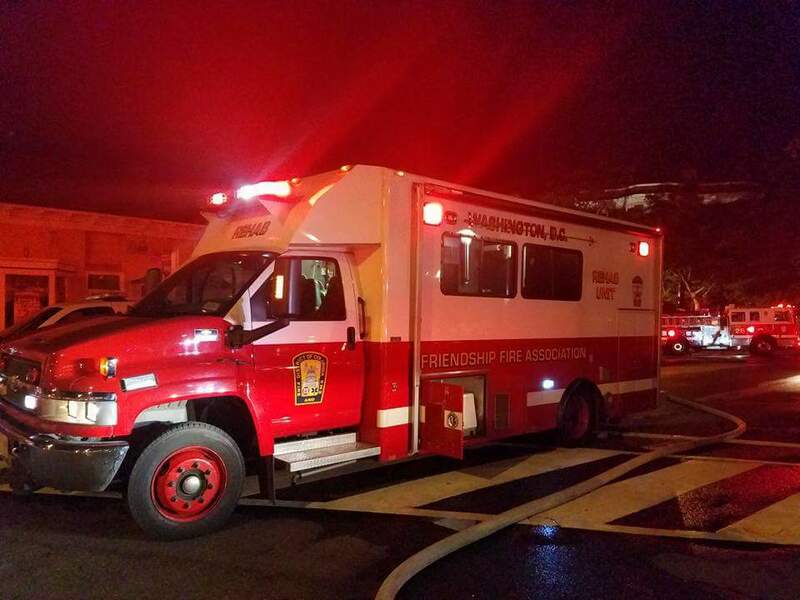 A working fire dispatch was sounded for the blaze, which heavily damaged a basement unit in an occupied three story apartment building. It took approximately 10 minutes to control the fire, which was dispatched at 4:27 PM. No injuries were reported. 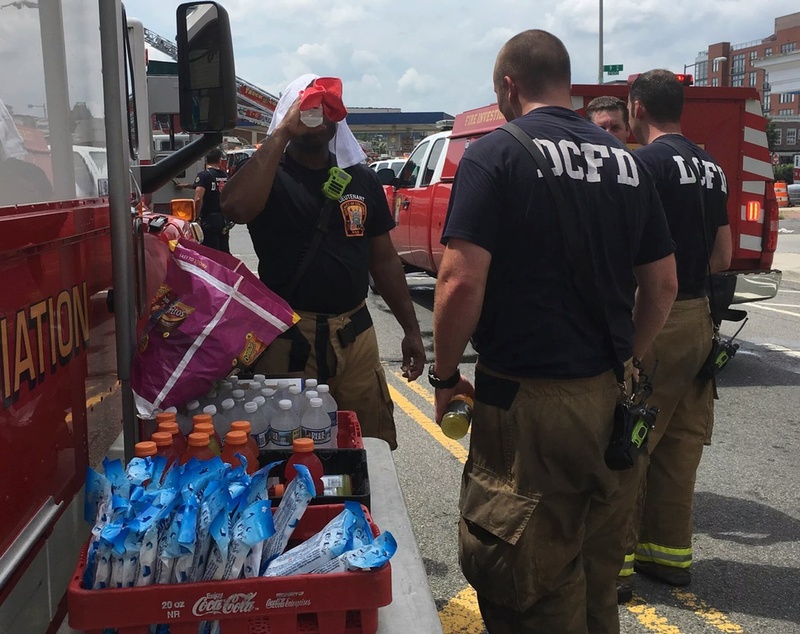 The volunteers of the Friendship Fire Association, staffing the department's rehab unit, provided cooling towels, gatorade, and water to the firefighters, who fought the flames during the current heat wave. 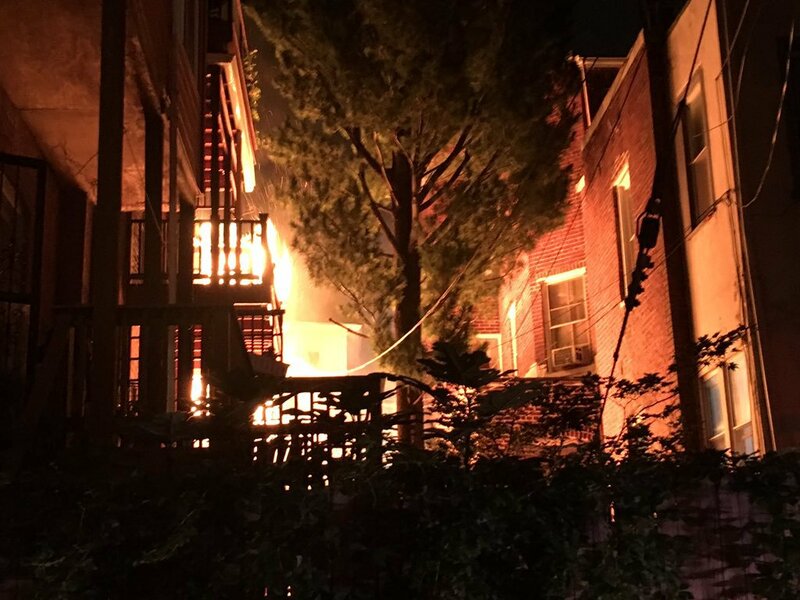 A fierce fire badly damaged a row dwelling in the Adams Morgan neighborhood on Fourth of July eve. 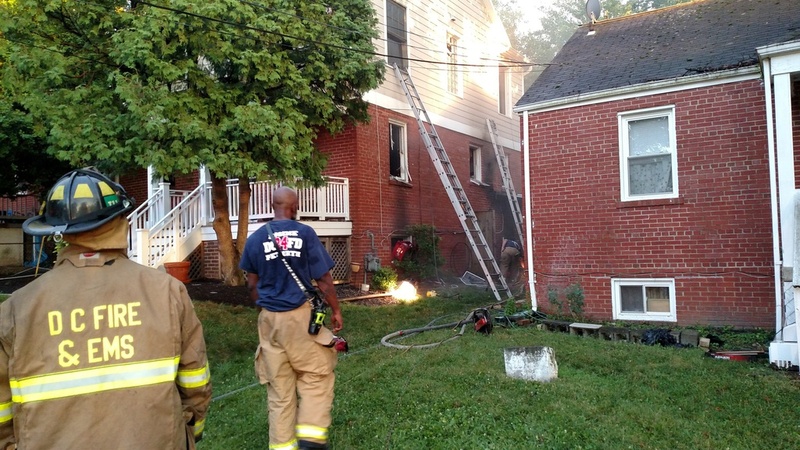 The blaze was reported around 9:30 PM in an occupied, three story row dwelling at 1824 Calvert Street NW. First arriving firefighters encountered flames billowing from two second floor windows on the backside of the house. Since the second and third floors comprised one apartment, the fire quickly spread upstairs, and also entered the attic space. 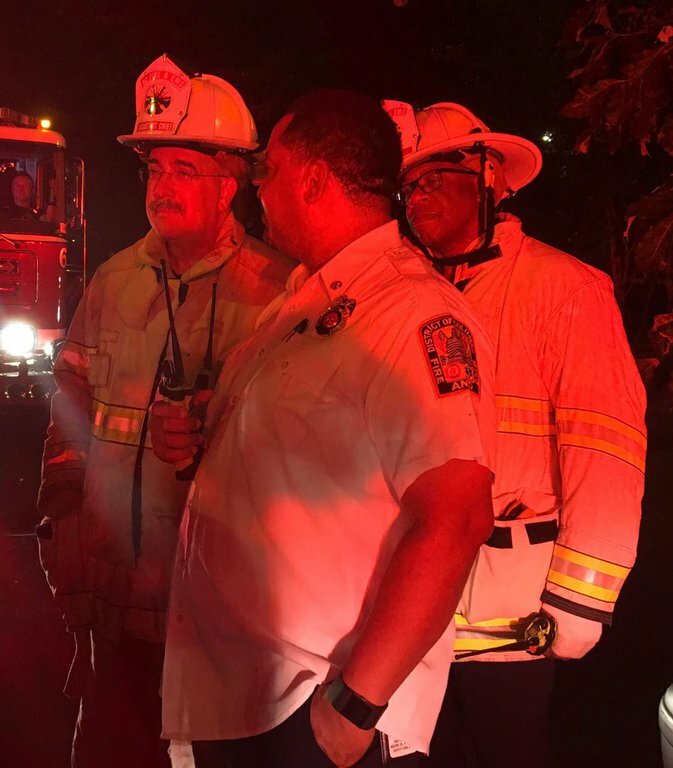 Due to the significant amount of fire and the potential for spread to adjacent attached structures, the incident commander called for a second alarm, bringing a total of almost 100 firefighting and EMS personnel to the scene with about twenty pieces of equipment. 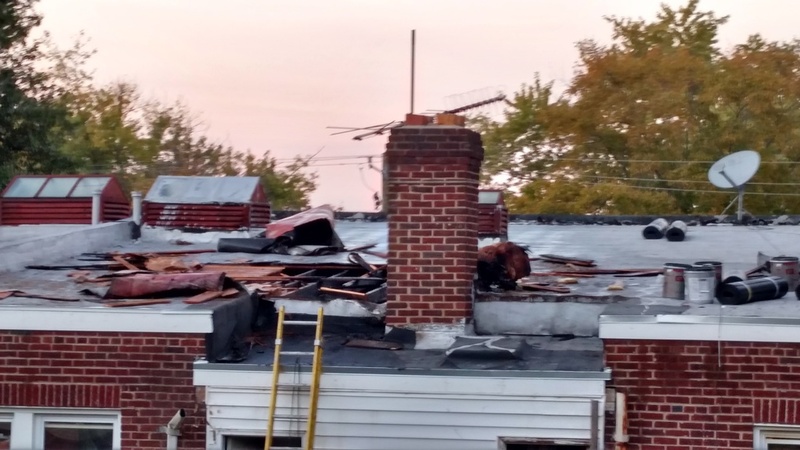 It took approximately twenty minutes before the blaze was declared under control, and firefighters were able to contain it to the original dwelling. 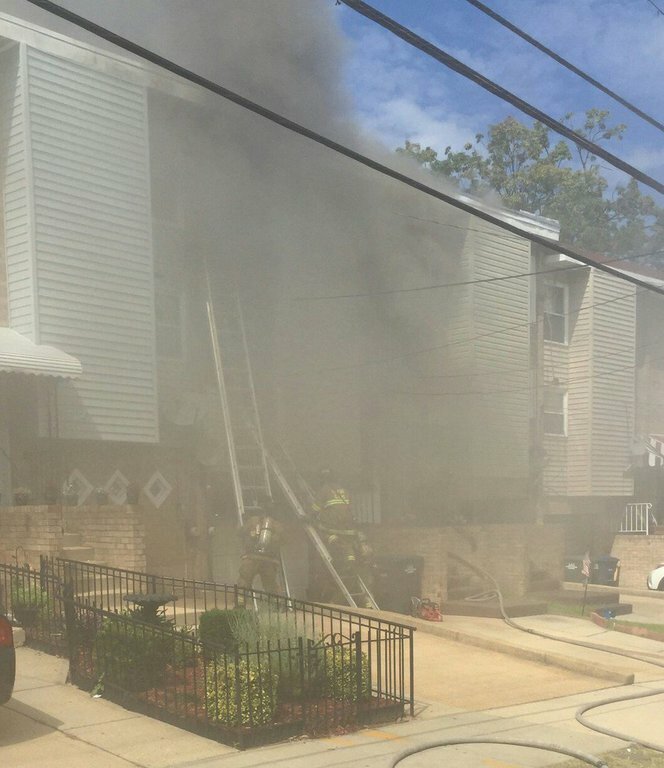 There were no injuries to firefighters or civilians, but four residents were displaced.